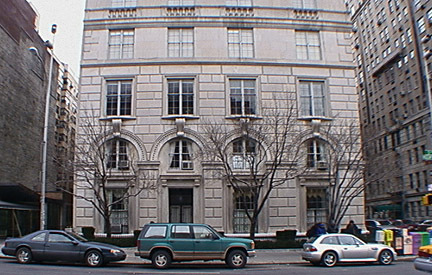 One of the supreme residential buildings of New York, this limestone-clad apartment building has an unusual fenestration pattern that hints at its unusual and dramatic apartment layouts. 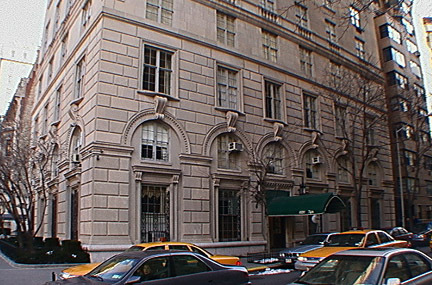 Its base is one of the finest in the city as it has four two-story arches on Fifth Avenue and six on the sidestreet, where it has its entrance. Designed by Warren & Wetmore, the main architects of Grand Central Terminal who also designed the elegant apartment building at 927 Fifth Avenue, this 14-story building was completed in 1925. The fifth-floor windows have balustraded decorative railings at their base and instead of a large cornice the building had a large balustraded railing around its top, which has been altered by the replacement of much of the balustraded columns with attractive iron railings. It has only 13 apartments and they are spectacular. The top triplex, for example, was taken by a member of the Kress family, whose incredible collection of Italian Renaissance paintings, the largest ever assembled by an American, was largely given to more than 20 American museums including the National Gallery of Art in Washington. The Kress fortune came from a discount store of the same name that competed with Woolworth's. One hallway in the Kress apartment had many drawings by Albert Durer and one bedroom had large panels of young girls throwing a mannekin into the air by Goya flanking the headrest. 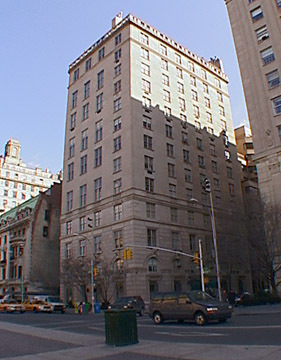 The building is across from the Metropolitan Museum of Art, but one block north of its main entrance. 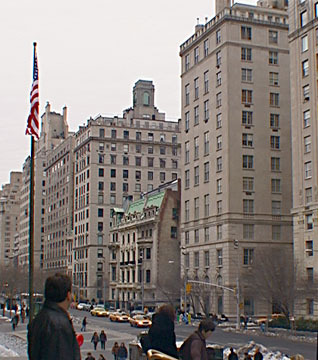 It is also one block south of the busy exit of a Central Park transverse road so that it is relatively quiet for its busy location. The building has a very impressive maisonette apartment with its own entrance on the avenue and extensive sidewalk landscaping on the avenue. With its spectacular and grand apartments, some with 18 foot ceilings, great park views and fewer apartments than floors, this is one of the city's most desirable address. The building has a concierge and doorman and handsome sidewalk landscaping, but no garage, no health club and no balconies. Handsome lanterns flank its one-step-up entrance and the building permits protruding air-conditioners.